Google made a small acquisition today of an Israeli startup called LabPixies, which is probably best known for its Flood-It! game on the iPhone (it’s the new Tetris). But LabPixies also creates tons of games in the form of iGoogle gadgets, Facebook apps, Hi5 games, MySpace games, and Android apps. Google did not disclose the price of teh acquisition, but the number going around Israeli venture capital circles is $15 million to $25 million. (TheMarker, in Hebrew, also reports $25 million as the price). Not bad for a startup that only ever raised $1 million in angel funding back in 2008. The team will be based in our ever-growing Tel Aviv office and will anchor our iGoogle efforts across Europe, the Middle East, and Africa. We are looking forward to working with Labpixies to develop great web apps and leverage their knowledge and expertise to help developers and improve the ecosystem overall. What LabPixies is good at, however, is taking a game on the Web and creating versions of it across different platforms, especially the iPhone and Android. 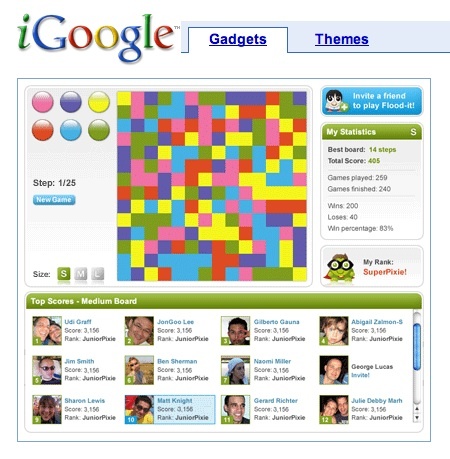 Its iGoogle gadget games may generate as many as one billion impressions a month, but it makes all of its money on the iPhone. Google will likely try to sprinkle some of that LabPixie dust on Android now. One strategy could be to create games and apps first for iGoogle, and then use the reach of iGoogle to push those apps to Android. But they’d better not remove Flood-It! from the iPhone. I love that game.